Recently, I was with a friend, enjoying some time of sweet conversation, which included the wonderful gift of holding her baby. After a little while of loving on this little one, it became abundantly clear that mama was needed. Someone was very hungry. As soon as the baby was given nourishing milk, the cries of desperation gave way to a very peaceful and content baby. The desire and intensity a baby has for milk is the same kind of craving we are to have for God’s Word. Just like a baby needs milk to physically grow, we need God’s Word to grow spiritually. 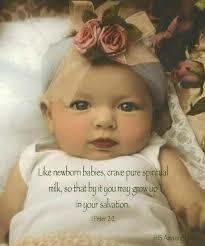 Peter tells us we are to crave reading God’s Word like a baby craves milk. The simplicity of this, leads me to ask myself (and you) a simple question. Do I (you) crave God’s Word? It is so easy to crave everything else but God’s Word, running to things that we long for. When we don’t take time to read God’s Word, we find ourselves making attempts to excuse our behavior away. “I was too busy.” “I just felt tired.” ” I will try and remember to do that later.” “I find myself getting bored with reading the Bible.” “I don’t want to get up any earlier than I already do.” “Hopefully, I wont forget tomorrow.” I think I have personally used each and everyone of these excuses. How thankful I am that God’s grace abundantly abounds to me for all the times I have made these statements. What I have learned is that in each season of life, I have to find a time that works best for me to read the Bible. Some days, my time is shorter than others. I think the key to having a consistent time in the Word of God has a whole lot to do with humbling yourself before a Holy God and having a submissive heart that is willing to make sacrifices to spend time with Him. When I humble myself and open my Bible, meditate, memorize, pray, journal and rest on God’s promises, I am never disappointed. As I do this, His grace pours out on me. Sin comes to light. Wisdom is gained in circumstances I face. Negative attitudes are changed as I see life through the lens of Truth. My doubts, fears and worries are much smaller. I see how great God is and how small I am. His words search the deepest parts of me, molding me and sanctifying me. I am refreshed and able to serve and refresh others. Seeing Him do this in me, makes me crave our time together all the more. When we taste His goodness and love in our lives, it’s difficult to desire anything else. so that I may keep your law and obey it with all my heart. persevere my life according to your word.